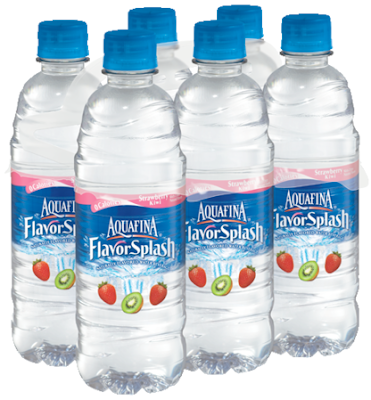 **Disclaimer: I am a participant in a Mom Central campaign for Aquafina FlavorSplash and have received various FlavorSplash samples to facilitate my participation. Mom Central will send me a gift card at the end of the program. I am a huge water drinker!! I will admit I have a soda every now and then, but I can pretty much listen to my body and can tell when I need to start chugging down the water! I do have preferences such as no tap water and cannot drink water when it's ice cold....just something about that that gives me a migraine. With the kids it can sometimes be an obstacle to get them to drink plain water - especially the boys for some reason. I am pretty strict when it comes to soda - no soda or dark beverage of any kind, including tea and sweetened drinks. This is a great alternative for those who can't drink plain water. Strawberry is one of my favorites - I love strawberries so just knew I would like this one! Can you believe this has zero calories and no added juice! I know some Moms that will not give their children juice because of the added sugar. This is a great alternative! If my kids drink it I know it'll be a huge hit and something I can feel good about serving to my kids. Give it a try, click here for $1.00 off coupon.